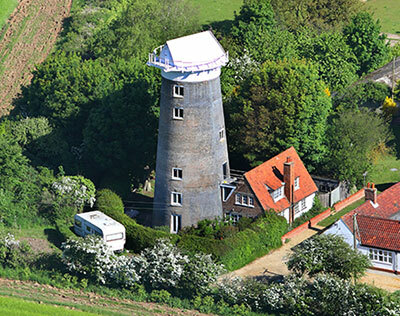 Ringstead towermill was a six storey tarred brick that once had six sails, which was quite unusual for Norfolk. The mill was built between 1837-1842 and had a boat shaped cap with a deep petticoat and a stage on the second floor. 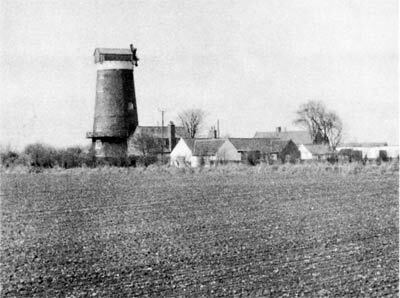 It stood at the end of a track some ¾ mile north of the village along with a cottage and outbuildings, having been built on the site of the earlier southern_postmill. When first built the mill had four single shuttered patent sails but two additional sails were added soon afterwards. The sails drove 3 pairs of French burr stones, a flour cloth machine and a jumper. The brake wheel and wallower were made of wood, as was the upright shaft. The dust floor was 17 ft. in diameter. A brick keystone on the first floor had the Le Strange rampant lion carved on it. Terrington St Clement Orange Farm, Walsoken West Walton Highway and West Walton Ingleborough. 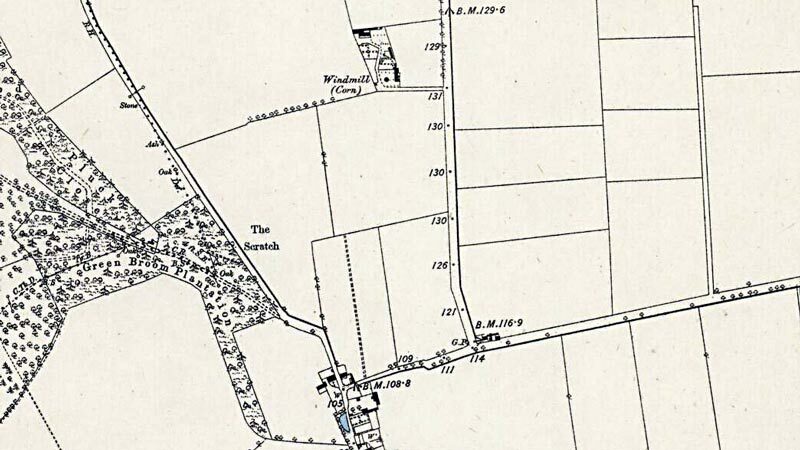 Both Faden's and Greenwood's maps show two adjacent postmills at Ringstead, the northern_mill and the southern_mill, the latter was advertised for sale and removal before Henry L'Strange Styleman le Strange built a towermill on the same site c.1840. 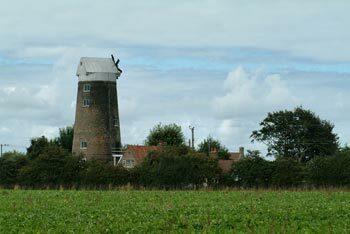 It was reputed that the southern_postmill was moved about 2 miles east to Beacon Hill in Thornham, although up until 1863 the Rate Book in Thornham only records John Crane as owning one mill in Staithe Road even though both mills were known to be there in that year, thus the Ringstead_southern_postmill may have been assembled there during the course of that year, becoming Thornham_composite_mill. A capital TOWER WINDMILL with six patent sails, Flour Cloth Machine, Jumper etc. driving three pair of French stones, with Cottage, Gardens, Granary, Stable etc. and about an acre and a quarter of arable land. Apply to Mr. William Norgate, Heacham. Notice to Debtors and Creditors of William Norgate. Dated 25 July. Relates to a Deed of Assignment for the benefit of his Creditors. L. W. Jarvis & Son, Solrs. WANTED, a good pair of second hand 4 ft. French Burr Millstones. Apply to John Crane, Ringstead, Lynn. 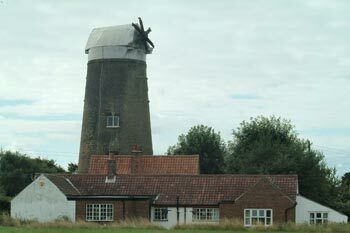 The mill was converted to domestic use in 1927 and in 1981 still contained the windshaft and the six armed cross canister. The cap was removed in 1927 and the stones were removed later. On 16th March 1974, Mrs. Clare Chapman wrote to Philip Unwin to say that her parents, Prof. & Mrs. Cornford, bought the mill in 1927. It was derelict and had no sails. 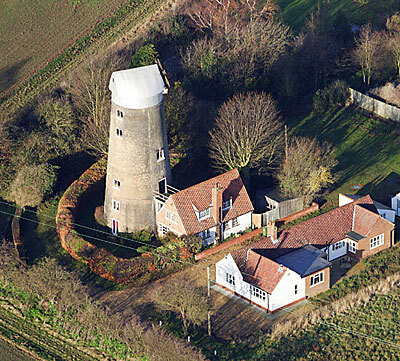 It was converted to residential use by architect Hugh Hughes of Granchester near Cambridge, who also converted Burnham Overy towermill and still owned it. At Ringstead Mill, Norfolk, the oak machinery has been preserved and gives a robustious air to the round rooms. Drive coming down from 3rd floor to bolter etc. Under staircase to 3rd floor a few pieces of iron - spider? Wooden clasp arm 7 ft. great spur wheel with iron segments. 1 pair of 4 ft. French burr stones in 8 sided modern vat with no hopper or shoe. Overdriven. Tower windmill. Early C19. Header bond gault brick partly blackened, temporary C20 asbestos roofing. 6 storey tower, cap forming further storey. South face with ground floor C20 door in origianl opening under gault brick flat arch with central keystone. 4 of the 5 floors above with one 2-light casement windows under flat arches with keystones, on first floor with rampant lion crest. West face with 4 openings, the 3rd floor opening formerly a loft door, north face with 5 openings, east with one boarded 2-leaf loft door and one casement. Brick eaves cornice, wooden shuttered skirt perhaps original. To north face the surviving metal canister for 6 sails. C20 asbestos covering of cap. c.1920 house attached at east is not of special interest. In September 1939 my brother and I were evacuated to old Hunstanton billeted with a Mrs Wyn who took us to visit an elderly man at the old mill at Ringstead I understood he was related to her in some way, in conversation he said he had spent a long time at sea He gave me a secret opening wooden box that he had made by hand during his quiet time whilst at sea. His presence doesnt seem to fit in with the history of the Mill, could he perhaps have been the caretaker of the Mill at that time? PS Mrs Wyns Mother, Mrs Finbow also lived with us. It remains a minor mystery to me. 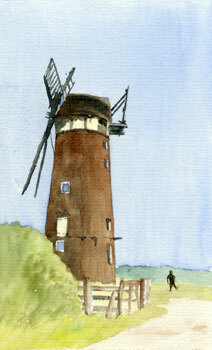 Here is a fine Six-Sail Mill, erected a few years ago, by Mr. Le Strange, at the cost of about £1,500. White's 1854: A fine six sail mill was erected here some few years ago at the cost of £1,500.